The first 7 vertebral bones on the spinal column form the cervical spine and are in the neck region. The neck bears the weight of the head, allows significant amount of movement, and less protected than other parts of spine. All these factors make the neck more susceptible to injury or other painful disorders. Common neck pain may occur from muscle strain or tension in everyday activities including poor posture, prolonged use of a computer and sleeping in an uncomfortable position. Cervical disc herniation: Disc herniation is the bulging or rupture of the soft fibrous tissue, discs, cushioning the vertebrae. Cervical disc herniation refers to herniation of discs in cervical spine region or neck region. Because of this the soft central portion called nucleus pulposus bulges out through the tear in the capsule. The condition can be caused by the normal aging or by traumatic injury to the spine. 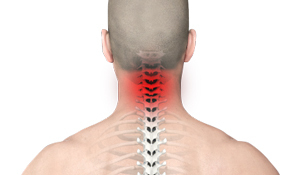 The condition results in painful, burning, tingling or numbing sensations in the neck. Treatment options include rest, ice application, elevation of the injured area, use a soft neck collar and neck immobilization using a splint, cast, or sling. Medications such as anti-inflammatory drugs, analgesics and muscle relaxants may be prescribed to reduce the pain and inflammation. Certain stretching and strengthening exercises may be recommended to strengthen the neck muscles.